CION is the new 4K/UltraHD and 2K/HD production camera from AJA. Shoot direct to edit-ready Apple ProRes 4444 at up to 4K 30 fps, ProRes 422 at up to 4K 60 fps, or output AJA Raw at up to 4K 120 fps. CION is the union of great design and functionality, an engineered aesthetic that we are proud to describe as the Science of the Beautiful. CION can encode 4K/UltraHD and 2K/HD directly to 12-bit ProRes 444 internally. Using this high quality and widely supported codec to record CION’s film like image and superb color rendition will provide the easiest route to postproduction for 4K yet. CION’s extensive Gamma modes offer great flexibility to let you capture the scene exactly as lit in Standard, Expanded or Video Gamma modes. Cine and ‘None’ allow more latitude in post for you to create your own look and feel. This Gamma mode allows the user to dial in a very accurate image in camera for those scenarios where time for postproduction is very limited. The frame shown is taken from an UltraHD 444 sequence, and the image was exposed and color corrected in camera to accurately capture the vivid greens of the foliage and distinctive orange and yellow coloring of the California Poppy with no postproduction required. 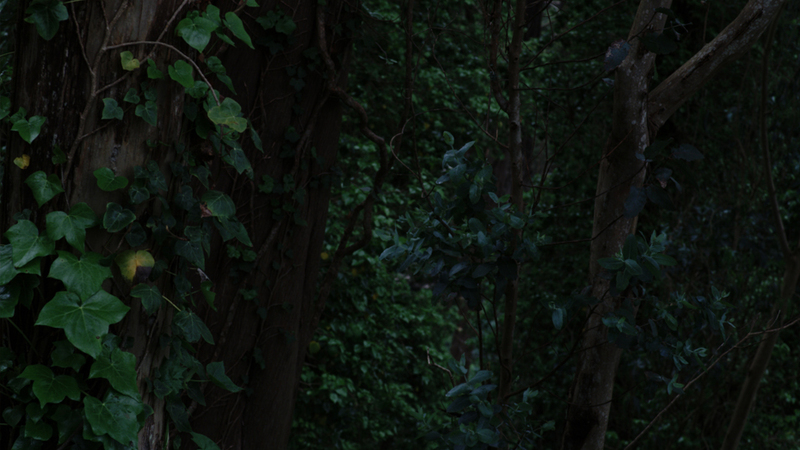 This Gamma mode allows the widest possible dynamic range when shooting. 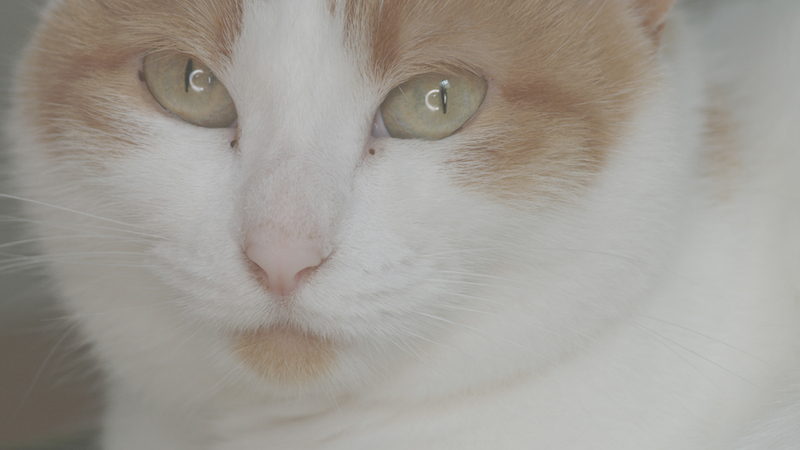 The frame shown is taken from an UltraHD ProRes 444 sequence; The image itself was exposed to account for the highlights and the white fur. The before version is lower in contrast and seemingly lacking in smooth gradients and fine detail. However, the after version clearly shows just how much picture information is available in post. Note the subtle gradients of the eyes and clean, defined detail that emerges. This Gamma mode effectively disables any adjustment curve being made to the image whatsoever. The frame shown is taken from an UltraHD 422 sequence. The before version appears very dark with little definition to trees and leaves. The after version again shows just how much information can be lifted within the picture, effectively allowing the scene to be closely controlled in post by lifting the shadows accordingly. The ProRes 444 and 422 workflow for CION allows you to capture high quality images in an easily managed file format and size. The Pak dock provides fast transfer of footage into your local media storage and directly into a wide range of NLEs and finishing tools of choice with no need for transcoding. Native file recording means you’re able to better connect production to post; keeping the image quality at it’s highest throughout. CION offers easy output of up to 4K 30 fps AJA Raw via the Thunderbolt™ connector on the rear of the camera and by using AJA CamXchange and a Thunderbolt enabled fast RAID and laptop. 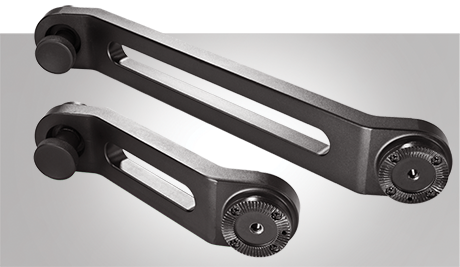 Perfect for studio environments where complex, keyed shots require the most postproduction processing. Although CION offers full 4K ProRes 4444 encoding at 12-bit internally to Pak Media you may also elect to output AJA Raw to other best in class products from AJA with our proprietary, powerful but totally free AJA Control Room™ software and connected fast RAID storage. 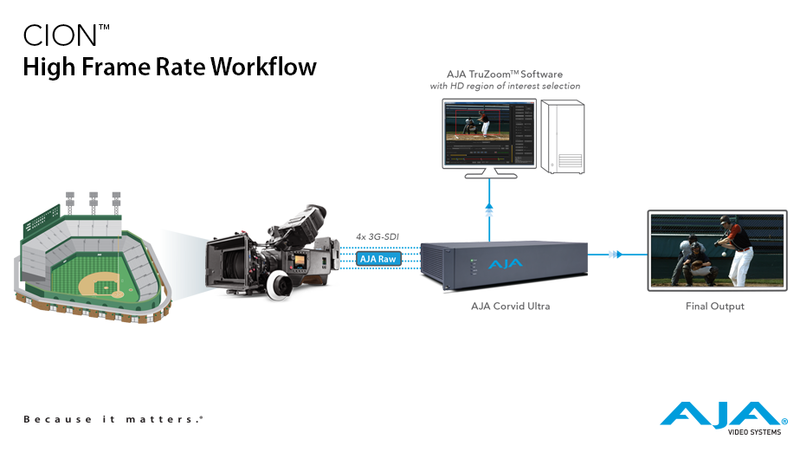 Use AJA Io® 4K to capture AJA Raw over SDI at up to 60 fps at 4K to provide outstanding postproduction quality for even the most demanding grade or visual FX requirements. You can also choose the unrivaled AJA KONA® 4 to capture up to 120 fps at 4K via the 4 x 3G-SDI outputs to create beautiful and detailed slow motion with an engaging cinematic feel via AJA Control Room. This reel was made to demonstrate the improved highlight handling and black detail available to CION users in the new V1.3 firmware, released at NAB 2016. In addition, the CION Gamma names have been updated to closer reflect each individual mode. 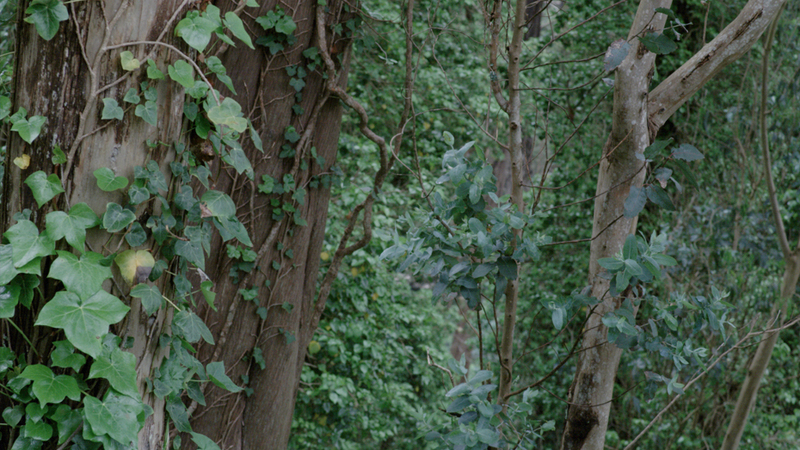 Images were captured, edited and graded in UltraHD ProRes 4444 before upload, with Vimeo providing the final HD encode. AJA’s approach to the development of CION was not only towards the external aesthetic and it’s deliberate ergonomic styling; the image processing itself was considered throughout with the result being outstanding color accuracy in virtually any environment. CION is capable of capturing images at up to 4K 12bit 444 allowing the broadest dynamic range possible and providing excellent latitude for postproduction finishing. To minimize the amount of post processing required CION also allows for great flexibility in controlling the image captured by using our intuitive menu system and it’s straightforward operation on-set. A variety of gamma curves are found within the Exposure Index menu to suit the highlights and shadows within a given scene. In addition, you can choose from a range of color temperatures within the White Balance menu providing standard values to suit your scene. You are also able to Auto White Balance any scene by simply holding down the ‘WB’ button on the operational side of CION for three seconds. For those situations where more precise color control is beneficial on-set you can control both the Saturation and also Color Correction via their corresponding menu options. This additional control can save valuable time in post, especially on tight deadline projects which require speedy delivery to broadcast and allows you to adapt to changing light in even the most demanding environments. PL mount lenses are the industry standard for cinema and professional production cameras, and are widely available the world over. In addition, CION’s lens mount has been designed to be removable so third parties may develop mounts for other lens types. An integrated OLPF (Optical Low-Pass Filter) reduces unwanted moiré effects while still retaining vital image detail. CION features a 4K APS-C sized CMOS sensor with an electronic global shutter and 12 stops of dynamic range. Lenses designed for Super 35mm cover the sensor imaging area and the global shutter eliminates the undesirable qualities associated with rolling shutter based sensors. CION can record at 4K (4096x2160), UltraHD (3840x2160), 2K (2048x1080) and HD (1920x1080). 2K and HD are hardware scaled from the full 4K sensor, resulting in beautiful oversampled images, which also retain your lens’ focal length at any desired resolution. Frame rates up to 50 and 60p are supported - even at full 4K resolution. 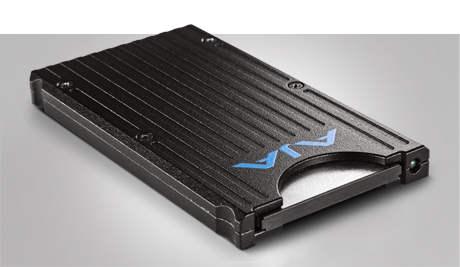 CION uses AJA’s proven SSD based Pak storage. The robust high speed compact storage mounts directly in-camera and allows recording of 4K/UltraHD and 2K/HD as ProRes 4444, ProRes 422 (HQ), ProRes 422, ProRes 422 (LT) and ProRes (Proxy). 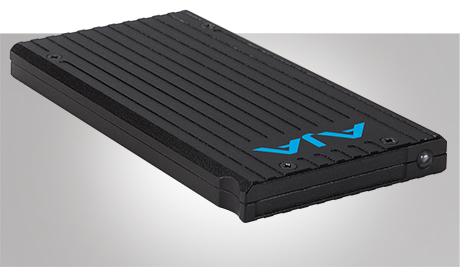 Choose from generous 256 GB or 512 GB capacities and by utilizing the AJA Pak Dock (sold separately) you can transfer your footage over high speed Thunderbolt™or USB 3.0. 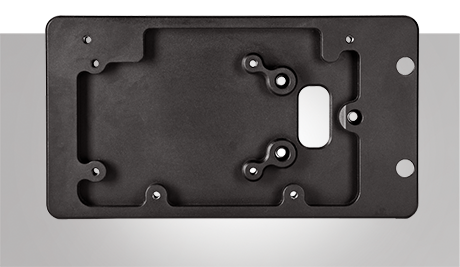 Aluminum cheese plates are fitted to both the top and the bottom of the chassis to provide easy mounting of accessories from both AJA and third parties, with standard thread sizes to offer the widest range of compatibility. CION’s considered design brings ease of operation to both field and studio based productions. For single users, set up and operation is intuitive. For complex productions that require camera operators, camera assistants and digital imaging technicians CION offers unrivaled flexibility. In such a scenario, the camera operator can use one monitor output for framing, the camera assistant another monitor output for judging focus and the digital imaging technician can use yet another monitor output as well as the web UI to configure the unit with total resolution independence. CION offers more simultaneous monitoring outputs than any other camera. 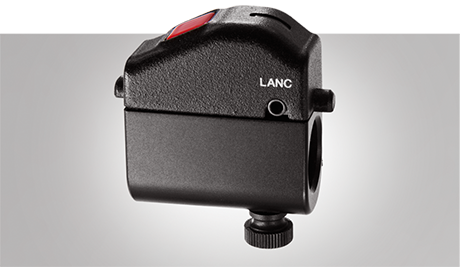 The LAN port at the rear of the CION camera brings a wealth of control to the field or studio; every feature is controllable remotely via a web browser with no proprietary software required. Using an easily set up IP address for the camera and utilizing a simple Ethernet cable you can connect to any laptop on any platform and use a web browser to communicate directly with your CION camera. A video feed has also been included to assist with remote or multi-camera scenarios. Multi-camera wireless control can be easily achieved with a standard WiFi access point, such as an Apple AirPort. You’re able to adjust every camera parameter to suit your needs by either clicking on the section appropriate in the sidebar of the browser or you can use the buttons in the window that reflect those found on the camera. You have the freedom to work either way. You can see clearly the options available to each section; navigation is intuitive at every step. Having made adjustments you are able to save these as a preset for use later; quickly and easily recall the preset you need. You can even save a preset and deploy it to other CION cameras that you have linked via a simple Ethernet switch. Up to twenty banks of presets can be saved bringing huge flexibility and time saving while shooting. All interface controls are found on the side of the camera facing the operator to provide easy single user functionality. The menu structure itself is elegant and free of cumbersome sub-menu navigation. Confidently dial settings with a robust selection knob that gives clear mechanical feedback as you adjust. The integrated confidence monitor not only displays the menu information but also previews your real-time image, allowing independent operation. LED VU meters are placed for easy and accurate audio monitoring. Control knobs for each audio channel allow adjustment of the input level. A headphone monitoring output and a headphone volume control knob are also provided. in HD or 2K then every single output is live at that resolution giving you up to eight outputs to share on-set. The built-in confidence monitor also allows yet another way to see the image being captured. 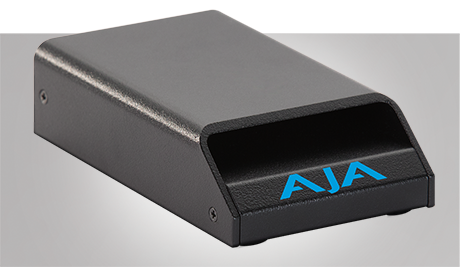 The AJA Pak Dock and Pak media are designed for field use, featuring a rugged and reliable form factor; unlike a bare SSD drive, AJA Pak media features a multi-insertion rated connector. Connecting to CION via the LAN connector provides real time information regarding the Pak currently in use and by utilizing a Thunderbolt enabled RAID storage drive you can quickly back up your Pak media as you shoot. CION multicam shoots are straightforward to implement and manage by using a laptop with a simple Ethernet switch and LAN cables. The web UI allows complete and independent set up of multiple CION cameras; you may name each camera and consolidate control of the cameras from within a web browser using the unique gang recording feature. The web UI will also allow real time monitoring of the capacity of the Pak media used in each CION. File naming options are easily accessed in CION’s menu structure. There is even an option to create custom names for clips as well. CION is designed to create an open approach to accessorizing the camera. This open system gives you immense flexibility no matter the shooting environment, both indoors and outdoors. From shoulder to tripod and from dolly to crane, CION keeps all of your options open. The top accessory manufacturers in the world have also made accessories specifically for CION. PL mount lenses are widely offered in standard focal lengths as well as zoom options. Manufacturers continue to release new and improved lenses designed for the demands of 4K resolution. Because the PL mount system is firmly established in the highest quality production, you can choose the right lens to suit your creative needs. 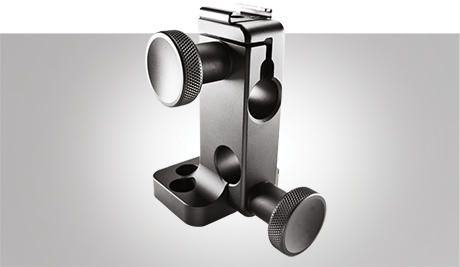 CION’s lens mount was also designed to be easily removed to allow an even wider choice of lens system to suit your needs. The open system approach allows you to choose from a wide range of electronic viewfinders and connect them directly via CION’s HDMI or 3G-SDI. Dedicated monitoring outputs are even conveniently placed at the front of the camera. A power connector near the front can also provide power for many electronic viewfinders. Unrivaled monitoring options put CION at the heart of production. In addition to the front 3G-SDI and HDMI monitor outputs, additional rear 3G-SDI and HDMI outputs may also be used for monitoring. 4K and UltraHD monitoring is possible via the 4x 3G-SDI main outputs and the rear HDMI output (when appropriately configured). You can configure CION so that everyone can see what’s happening. Two balanced analog audio XLR inputs are built into CION allowing compatibility with a huge range of professional audio gear. You can choose to mount a shotgun microphone to the cold shoe found on the top handle or run longer cable from external mixers to CION. Independent switches for mic or line level as well as phantom power are provided meaning you’re ready for any audio situation. Removable cheese plates on the top and bottom of the camera make attaching accessories easy. The bottom cheese plate features 1/4-20 and 3/8-16 threaded holes. The AJA provided top handle attaches to the top cheese plate via 1/4-20 screws for example. CION’s top handle is based on standard 15 mm rods, allowing compatibility with third-party accessories and endless possible configurations. Standard sized rosettes on either side of the camera allow easy and dependable mounting points for handles and grips. By design, it’s incredibly easy to add a wealth of accessories to CION to enhance your shooting experience. CION offers the easiest and fastest route to 4K/UltraHD post yet. Native codec handling enhances your editorial experience, resulting in fast and responsive playback with no compromise in quality. Apple ProRes offers pristine image quality at extremely manageable file sizes. Using the latest generation of Apple Mac Pro and the AJA Io 4K along with Apple ProRes files from CION makes even 4K and UltraHD editing a smooth experience. CION can provide 59.94 fps material ready conformed to 23.98 fps for cinematic slow motion in your timeline with no post processing required. AJA Raw utilizes the Cinema DNG format which brings both high quality and industry standard compatibility with major NLE and finishing tools. 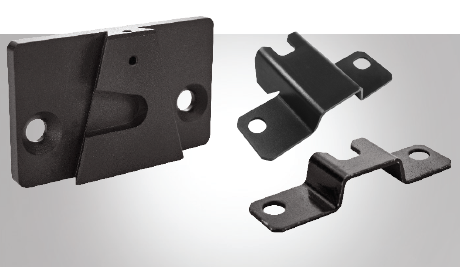 • Removable PL (positive lock) third party EF, B4 and G-Mount mounts are available. The following descriptions show the accessories specifically designed for CION by AJA Video Systems. Pak-Adapt-CFast allows you to use CFast media with CION. Simply insert the CFast card and once the green LED is lit, your media is mounted and can be formatted. You’re then able to record direct to your media. Pak-Adapt-CFast requires qualified media to ensure you get the best results. 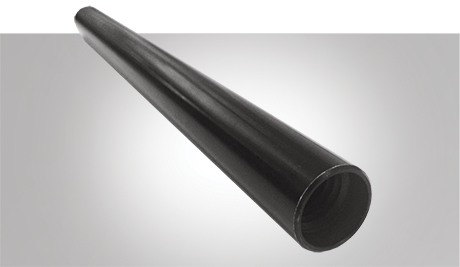 Although most types of CFast media will mount, only qualified media will provide proven performance. This accessory attaches to the bottom front cheese plate of CION. It features LWS spaced 15mm rod clamps. 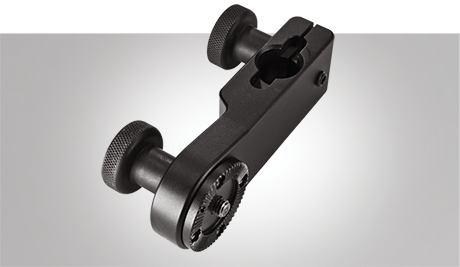 It is ideal for attaching follow focus units, lens supports and matteboxes. This piece is attached to the AJA-supplied Battery Adapter Plate and the heel of CION. 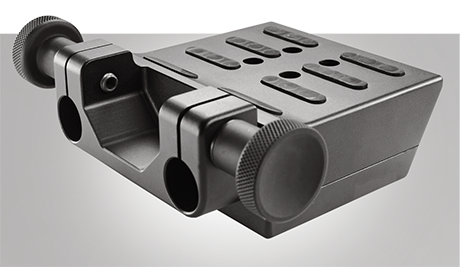 The Rear Baseplate features LWS spaced 15mm rod clamps allowing you to attach accessories to the rear of CION. In some situations, you may want to attach accessories to LWS spaced 15mm rods above the lens instead of below it. The Upper Rod Clamps accessory makes this possible. 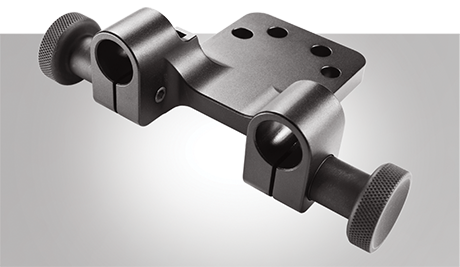 CION is easily fitted to ENG quick release tripod plates by using the Wedge and either additional Heel plate, depending on the base plates used. Move between a tripod set up and go directly to shoulder mount with ease. Each sold separately. This piece allows you to connect handles or other rosette attached accessories to 15mm rods. Available in 9” and 6” lengths, the Rosette Extension Arm fits directly to Hirth tooth rosettes mounted directly to CION’s chassis to allow you to configure CION to fit your needs. CION utilises standard 15mm rods, use these to connect matteboxes to the Front Baseplate or batteries to the Rear baseplate if you are balancing a longer zoom lens. You may configure this accessory to support electronic viewfinders or even lightweight on-board monitors. 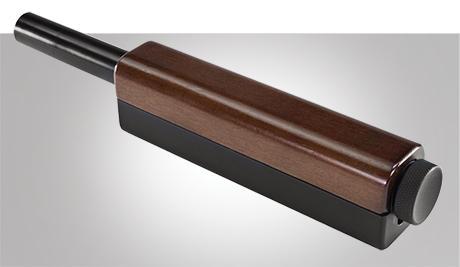 Nearly infinite adjustments are possible via sliding 15mm rods and the L-shaped bracket. 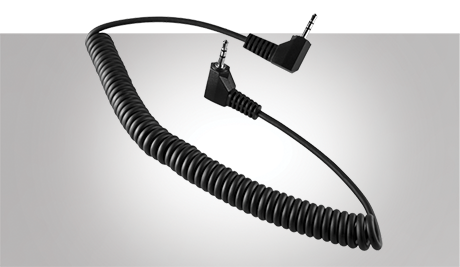 If you are using the optional Rosette Extension Arms in combination with the LANC collar and Handle Grip then the LANC cable is required to allow start/stop when recording in the field. One short LANC cable is included with CION for use with the included Handle Grip Mount and Handle Grip. 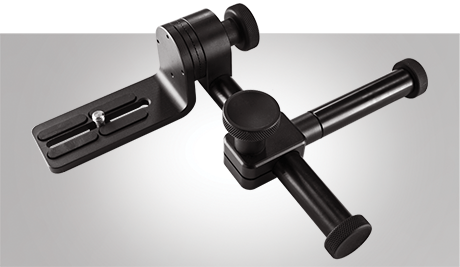 One Handle Grip with 15mm mounting rod is included with every CION. Additional Handle Grips are available to purchase so you may expand the way in which CION may be operated in the field in conjunction with the optional Rosette Extension Arms and Rod To Rosette Adapter Mount. One Handle Grip Mount is included with every CION and it is used with the top cheese plate mounted into the CION chassis and the included Handle Grip. 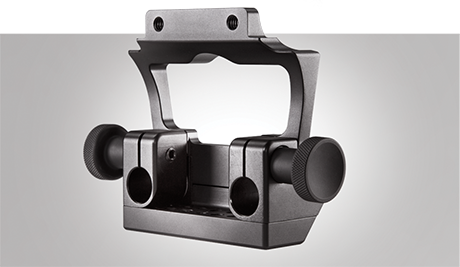 The optional Viewfinder Mount can also used with the Handle Grip Mount. Spare Handle Grip Mounts are available to purchase separately. One Battery Adapter Plate is included with every CION and features standard tap-holes for popular third party battery systems. This is used in conjunction with the included Alternate Rear Door Plate. When not mounted to CION the included Standard Rear Door Plate is utilized. Additional Battery Adapter Plates are available to purchase should they be required.